I've unfortunately become the least-interesting person one could know these days: mostly I'm whining about how uncomfortable I am (Little Reader is about two pounds, according to my pregnancy apps, and I swear, I feel every ounce!) or whining about how much I hate moving. So I'll restrict myself to books, for everyone's sake. 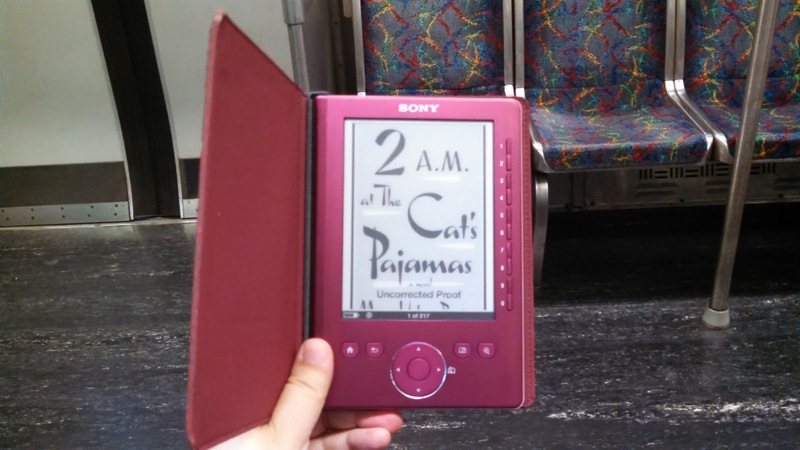 My weekend read is Marie-Helene Bertino's 2 A.M. at The Cat's Pajamas. I was charmed from the first page and can't wait for lunch time to dive back in! I have this book too. Oh, and it's okay if you vent here. We get it. I am sorry you are uncomfortable. I was okay with my son but 5 years later with my daughter, I was a wreck. I needed to vent now and too. Thanks, Ti, for understanding. I'm sure venting will come out soon -- I'm only going to get bigger, right?? You'll feel better once your move is over with! So true, Kathy -- I can't wait to be done with that hurdle. I'll feel like a person with personality again! You're allowed to complain! I hope you enjoy the book. Thank you, Denise, I appreciate that! Hope you're having some good reads, too! Hope you get some rest & relaxation over the weekend. Moving and pregnancy are both major excuses for complaining! I'm reading two chunksters this weekend: East of Eden by John Steinbeck and The Quick by Lauren Owen. I haven't heard about this book before! I look forward to your review! I'm reading Maggie's Wars and I haven't yet decided if I really enjoy it or not. I'm giving it a chance though! I think you are a rock star, dealing with your nasty neighbor, moving AND having a baby! I think I would be screaming from the rooftops if I was going through all that at the same time. These are the times escaping into books help, don't you think? You are even more interesting now that you are becoming a mother! You have every right to complain. The last trimester is uncomfortable, no bones about it! And moving on top of it, well, you're not boring in the least!!!! You're pregnant - I must have missed the announcement (I have been dropping in and out of blogging) Congrats on "Little Reader"!